Go to my recipe page and see how much I love seafood (NOT!). I rarely could fish at home—partially because of the price—but lately, I have been experimenting more and more with seafood and especially shrimps. 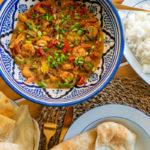 This shrimp curry recipe is one of my favorite seafood recipe to make because it’s easy, delicious, and perfect for when you’re cooking for a bunch of people. A few years back I would only eat a selection of fish types. My criteria were that it should not sound, smell, taste, or look like fish. So basically, I only ate seafood in disguised. The funny thing is that once you grow up your palette starts developing and with it also your curiosity. I often refused to eat something just a first glance (or sound when I hear the name of it), but now I’m more curious about the taste and slowly realizing that a lot of things I used to puke out are becoming one of my favorite food. That is the case of shrimps! 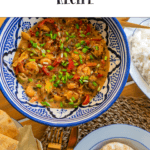 Once a fish that I would only eat when it was rolled in panko, fried, and hugged by a layer of rice has now become the main ingredient of one my favorite dishes, the Garlic Shrimp Pasta, and now this shrimp curry recipe. 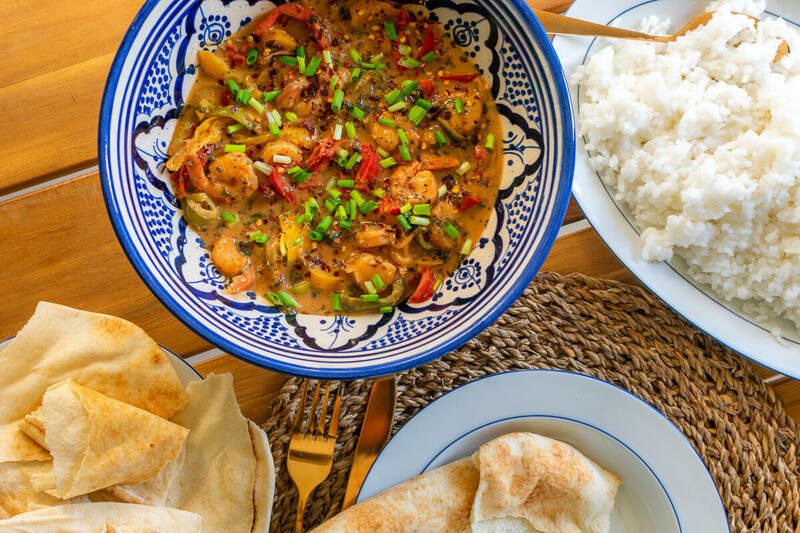 This Asian-inspired shrimp curry recipe has a blend of many different Asian flavors. The main and most flavorful one being the peanut. It’s those flavors that will make even the picky-non-seafood-eaters (like past-me) love this dish and forget that there is even shrimp swimming in that curry. The curry is best served with pita bread and rice. Yellow rice can also be a good option. Thaw the shrimp. 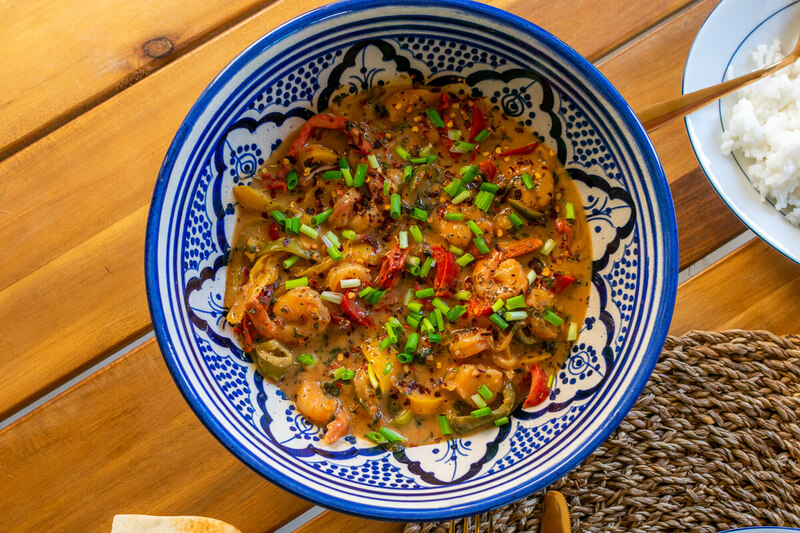 Place the shrimp in a bowl and coat with 1 tablespoon of the oil, garlic, red chili flakes, and salt. In another bowl mix the coconut milk with the peanut butter, lime juice, fish sauce, brown sugar, and ground ginger. Set aside. Heat 1 tablespoon of oil in a wok over medium-high heat. Add the shrimps and cook them for about 5-8 minutes. Transfer the shrimp to a plate when done. Add again 1 tablespoon of oil in the wok pan and cook the onions and peppers until soft. Add the shrimps and coconut mixture to it, lower the heat and let it simmer for 5 minutes. Turn off the heat and garnish with cilantro and green onions.